This, quite frankly, should be readily available in all hospitals and ambulances to dish out to the public who are having a bad day; this dish cures everything! The smell alone fills your home with delicious comforting smells that just instantly make you feel more relaxed. I know that this is one of the best things you can be greeted with after a long 12-14 hour shift especially when you haven’t been smelling the nicest of things all day. It’s great for kids and adults alike, its tasty, simple and is great hot or cold (in my opinion anyway). For those who don’t know a Cottage Pie is made with minced beef where as a Shepherd’s Pie is made with minced lamb. The recipe is based on an old Delia Smith recipe which my mum has adjusted and perfected over the past 13 years and it’s 100% pure paleo perfection! Once you try it, you will want to make it again and again and again. In a deep non-stick frying pan heat the olive oil over a medium heat and gently fry the onions until they become soft and start to brown. 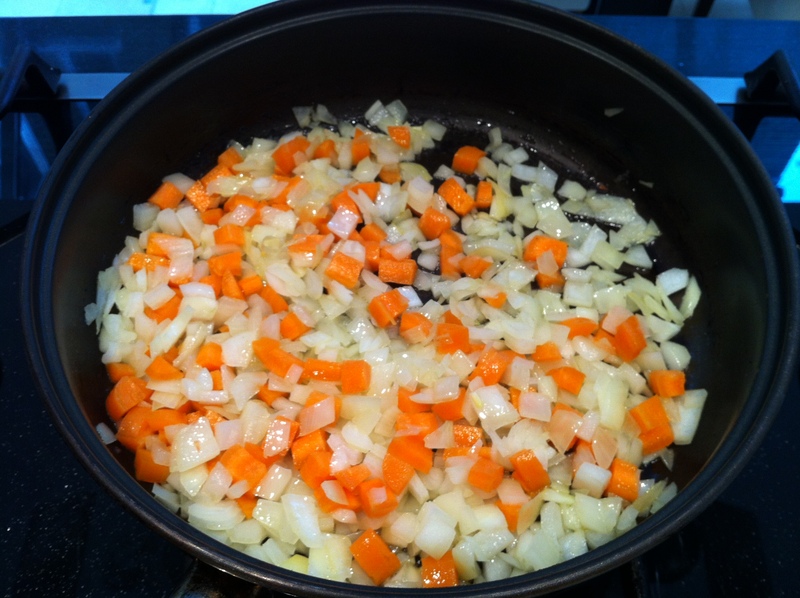 Add the chopped carrot to the pan and cook for about 5 minutes, advisable to infrequently stir to avoid burning. Remove the vegetables from the pan, cover with tin foil and leave on the side while you cook the meat. Turn the heat down slightly and add the meat to the oil. Break the meat apart with a wooden spoon/fork ensuring that it cooks evenly, season to taste with white pepper (can use black but I personally prefer white pepper in cooking). Once the meat has cooked, add the cooked vegetables and the spices. Now stir in the tomato purée and add the dash of red wine; this is not an exact measure but I would estimate it to be about 2-3 tablespoons (30-45mL). Now turn the heat down to the lowest setting and cover, preferably with a glass lid, and allow to cook while you make the sweet potato topping. Original recipe advises 30 minutes but I personally found that if you just leave it for the length of time it takes to make the sweet potato mash it’s still delicious. Preheat the oven to 200°C. 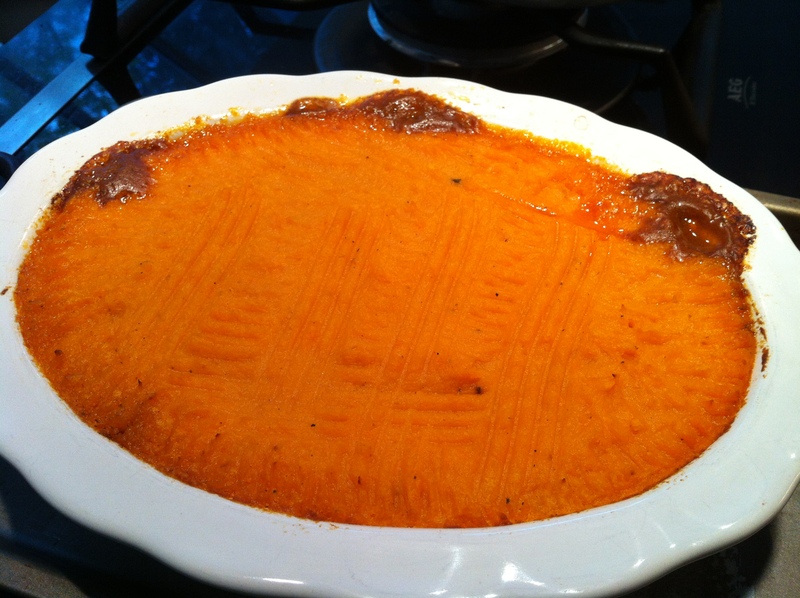 Whilst the meat is cooking gently you can now make the sweet potato topping. I know 900g sounds like a lot of sweet potato but it only equates to about 4 medium/3 large sweet potatoes. Now you can peel them or not, it is down to your preference. I personally prefer to leave the skin on (why waste it) but if you do this you must cut the potato up into medium-sized chunks not discs. Last time I made it all the rings stayed in shape and the filling fell out; this may give me an idea for another recipe but that’s another story. Take your sweet potato chunks and boil in water until tender; drain and return to the pot. Cover the pot with a clean tea towel and allow it to ‘self steam’ for a bit. Add the butter and mix with an electric hand mixer. Once the meat is ready, spoon into a baking dish and level it out with a spoon. 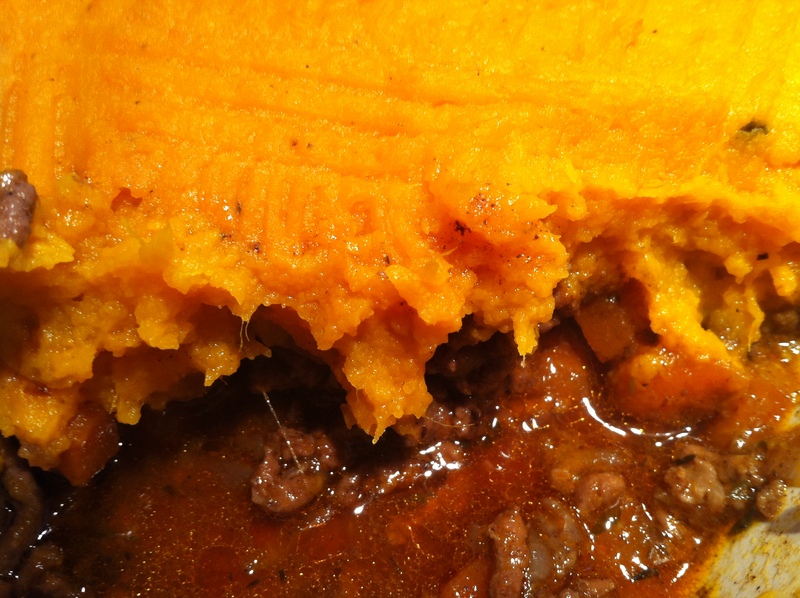 Spread the mashed sweet potato evenly over the top and cook in the over for 25 minutes. Now all the butter does it make the potato a little creamier (in texture and taste) however I have made it without using butter and you still get the same result; the top is just difficult to mould and make look neat. It depends how averse you are to butter in paleo cooking. Once cooked, take out and serve. The above picture is a smaller version of the recipe (yes I need my own individual one as I eat a lot of it myself) but just as delicious. All the credit goes to my wonderful mum who perfected this recipe over 13 years and has passed it on to me in tern and allowed me to pass on to my blog followers. Please enjoy as frequently as you wish :).